The sales brochure from 1989 pretty much sums up the Hunter 43 Legend, noting it was designed to exceed the requirements of sailors searching for performance without sacrificing comfort. This boat is capable of handling a stiff breeze, and belowdecks it doesn’t resemble a stripped-down ocean racer. The Hunter 43 Legend is by no means a heart-stopper in terms of beauty, lacking classic boat looks without a graceful sheer and eye-catching overhangs. There’s no varnished wood in sight, at least not on deck. It is fair to say the Legend 43 is more functional than fabulous, but die-hard Hunter fans typically aren’t interested in extolling the boat for its looks. They’re far more likely to tell you about the sloop’s sturdy construction, comfortable interior, seaworthiness and how easy it is to sail shorthanded. Although heavy fiberglass construction was still king in the late 1980s and early 1990s, the Hunter 43 Legend is crafted in a way that reduces some of that weight. According to industry reports generated at the time of production, the sloop’s maximum strength is achieved through a bonded, full-length, internal frame and stringer system that’s designed to increase stiffness without adding weight. The boat features an anodized, double-spreader fractional rig, a full-batten mainsail, furling foresail and a bulb-wing keel with draft of less than 5 feet. The chainplates are anchored to the frame system to carry the rig load. This construction technique helps to maximize interior volume, of which the boat has plenty. The deck hardware is heavy-duty, through-bolted and fitted with backing plates. The sole is teak and holly. This sloop is approaching the 30-year mark, which means the original standing rigging is likely in need of replacement. The same applies to any through-hull fittings and seacocks. The boat features internal halyards that should be inspected. The boat’s electronics may be outdated, given the quantum leaps in navigational technology. Since the boat was constructed, environmental laws addressing overboard waste have become more restrictive, which means a holding tank is required. Some owners have sacrificed one of the boat’s three water tanks to serve that purpose. If that job hasn’t been tackled, it should be figured into the boat’s value. The engine should be given close inspection, particularly if there’s no meter to record hours of operation and no maintenance records available. The Hunter 43 Legend’s deck is well designed. The sloop’s double-spreader fractional rig supports a mast that is 64 feet, 6 inches tall, making it a squeaker when it comes to sailing the Intracoastal Waterway and passing beneath federal highway bridges with 65-foot clearance. The mainsheet traveler and boom vang add additional support to the rig, so the main is relatively easy to handle. On most of these boats, the full-batten mainsail is enhanced by a flaking system. A roller furler helps tame the foresail while the jib sheets are controlled by inboard genoa tracks with cars. The internal halyards lead back to the comfortable cockpit, with its wide and deep seating. There are dual two-speed, self-tailing halyard winches, and a pair of two-speed, self-tailing genoa winches. The boat features stainless steel bow and stern pulpits, stainless cabin handrails, and a through-bolted, anodized toerail with amidships cleats. The spacious, T-shaped cockpit is fitted out with three lockers in addition to two transom lockers. The boat has wheel steering, and the binnacle hosts a lighted compass, wheel brake, gauges, and an engine panel with single-lever control. A sturdy table with drink holders and collapsible leaves adds another level of convenience to the cockpit. A walk-through transom allows direct access to a handy swim platform, making it easier to board from a dinghy or inflatable. Some Legend 43s were equipped with a bimini, which is prized by owners living in warmer climates. Despite such enthusiasm for the third cabin, Hunter Marine eventually reconfigured the interior of the Legend 43 and christened it the Hunter 430. The revamp provided additional room in the saloon, while the hulls remained nearly identical. Rob Lawnsby, owner of the 1991 Hunter 43 Legend Sea Fever, is among those who prefer the additional cabin. Lawnsby, whose Legend 43 is hull No. 5, keeps the boat in charter at his Narragansett Sailing School and Sailing Charters in Rhode Island, where he also uses it to teach American Sailing Association classes. The aft cabin has a private head, while the second is located off the saloon, which is big as a dance hall. A third head, actually a porta-potti, is located under the bunk bed cushions. The original Legend 43 with its third cabin featured a nav station with simple hinged seat and a tabletop on which to spread charts. Eliminating the so-called crew quarters made room aboard the Hunter 430 for a navigation office with desk and chair, bookshelves and file cabinet drawers. Belowdecks there’s plenty of natural light and ventilation streaming in from skylights and seven hatches with opening ports. Headroom is 6 feet 6 inches so even tall sailors seldom have to duck their heads. Descending the companionway, a functional galley to port provides adequate workspace, with a double-basin stainless sink, range, oven, and refrigerator with separate freezer. The appliances are propane-fueled. The counters are Corian. A settee is installed to port, just forward of the galley. The V-berth in the bow accommodates two, as does the aft cabin. In the latter, the double berth is mounted perpendicularly and has sink and toilet in close proximity. Locker space is abundant. Water capacity can vary by boat, ranging from 120 to 190 gallons. Some of the boats were fitted with a 75-gallon water tank in the bow, two 45-gallon tanks and a 25-gallon tank. Depending on owner preference, the 25-gallon tank or one of the 45-gallon tanks was usually converted to a waste-holding tank. Lawnsby said his boat has an “electroscan sewage system” that negates the need for a holding tank,” although the boat has one of those as well. Hunter yachts in this size range were originally equipped with an inboard, 40-horsepower Yanmar freshwater-cooled diesel engine, but it was replaced on the production line by the 50-horsepower Yanmar 4JH2-E FWC diesel. The less-powerful engine was introduced in 1984, but by the time the Legend 43 was launched, the larger model was standard. “It had been beefed up to 50-horsepower, with higher compression, different injectors and other modifications,” said Lawnsby, noting Sea Fever carries 50 gallons of fuel. During an early-fall sail aboard Sea Fever in Narragansett Bay, the boat consistently outran the other vessels in the fleet. In 25 knots of wind and large swells, the boat handled admirably. As promised, the boat was both maneuverable and predictable, easily pointing high into the wind. Its large rudder made backing into the slip less challenging. The Hunter 43 Legend is an affordable, well-built performance cruiser that’s easy to sail short-handed, forgiving under way, and provides loads of comfort belowdecks. PRICE: The price of a used Hunter 43 Legend can range from $80,000 to $130,000, depending upon condition and add-ons since most are relatively of the same vintage. DESIGN QUALITY: Designed by the Hunter Design Group, headed by Warren Luhrs, the boat is made for both performance cruising and comfort. CONSTRUCTION QUALITY: It’s constructed using a grid system inside the hull that helps stiffen the rig, allowing the use of less heavy fiberglass. USER-FRIENDLINESS: Owners love these boats because they’re relatively fast, responsive to the touch, easy to handle, comfortable below deck and offer amenities typically valued by cruisers. Wheel steering, a walk-through transom with swim platform, anchor well and rollers, removable helm seat, adjustable mainsheet traveler, lines that lead back to the cockpit, and two pairs of two-speed, self-tailing winches, are usually enough to keep owners smiling. SAFETY: The boat has a secure cockpit with deep and wide seats, wraparound windshield, beefy double lifelines with gates and stainless steel bow and stern pulpits, with through-bolted handrails. TYPICAL CONDITION: Conditions of a Legend 43 usually depend on whether the boat was in long-term charter or in a climate where it was sailed year round, which increases the number of engine hours and general wear and tear. Several Hunter Legend 43s were placed in charter with the Moorings. REFITTING: Many owners convert one of the boat’s three water tanks into a waste-holding tank. 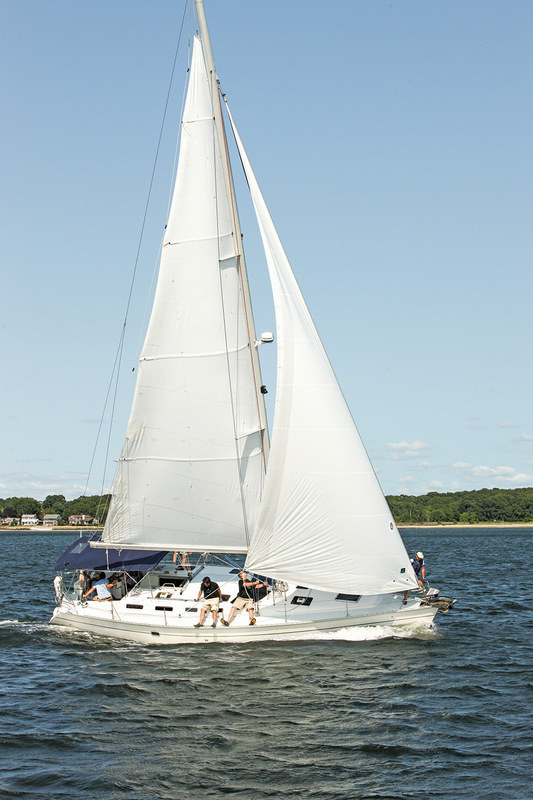 The boat’s original mainsail reefing system often is replaced by a Dutchman system. SUPPORT: Legend 43 parts can be found online at http://shop.hunterowners.com. Although Marlow-Hunter remains in business, it does little to service older Hunter models but may be able to answer questions. AVAILABILITY: The Legend 43 was in production from late 1989 to 1992, and was eventually replaced by the Hunter 430. Production records were lost in the shuffle when Hunter Marine was purchased by Marlow-Hunter, and the exact number produced is unknown. INVESTMENT AND RESALE: The boats hold their value, with used models approaching 30 years old still listed for sale at nearly $100,000.